This is quite an easy dinner to make, a few steps to it but its well worth it. Very tasty! Peel your butternut and chop it in half and then into slices. Place it into a roasting tray and sprinkle with a little olive oil and some dried herbs. Roast in the oven for 20 minutes. Chop your tomatoes in half, remove the center stalk thing and chop into slices. Place the slices into the roasting tray with the butternut, sprinkle a little olive oil over the tomatoes and place it in the oven for 10 minutes. Steam or boil the asparagus for 3 or 4 minutes until it is al dente. Remove the butternut and tomato from the roasting dish, and allow it to cool for around 15 minutes. Grease another oven dish with some oil. Place your pastry into the dish, curl the ends in and push them down with your fingers to create a border. 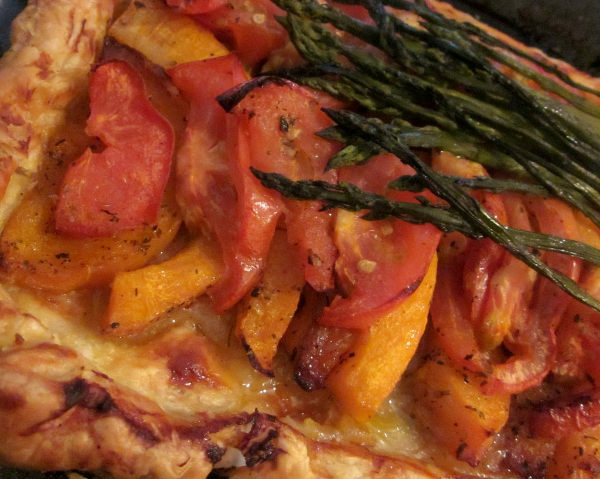 Arrange the butternut slices inside the border of the pastry, place the tomato over the top. Place the asparagus right on the top. It then goes into the oven for 35 minutes (the pastry must go a little bronzed and must cook through). Now for the balsamic glaze. Place a pot on the stove, pour in quite a bit of balsamic vinegar, I don’t know exactly how much but probably half a small cup. Put it on a medium heat and make sure to whisk it continuously, keep the vinegar moving in the bottom of the pot. Add the two teaspoons of sugar and keep stirring. When the vinegar has reduced to a third of the amount (and becomes a bit syrup-y) , it is ready. Pour the balsamic glaze over your tart. Cut into slices and serve with a green salad of mixed lettuce, spring onion, chopped cucumber and chopped fresh peas. Your oven cooking times may vary. Bottom line is that you want the butternut to be soft, the tomatoes to be gooey and the pastry to be bronzed! Andrea has been a vegan for around a year and a half after having been a vegetarian from the age of 10 years old. Andrea's main motivation for this choice of lifestyle is because she loves animals but she also recognizes the health benefits and the planet saving potential of this diet. You can also find Andrea at Vegan-a-licious.